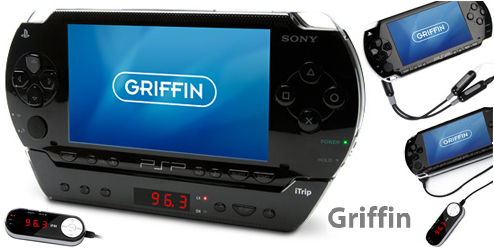 The first item, the Griffin iTrip Transmitter, is pretty much a “dock” in which the PSP can be placed into. (Similar to the iTrip Nano concept) The unit has a built in antenna, hardware controls, and a LCD display. (requires 2 AA batteries) The iTrip can broadcast 88.1 – 107.9MHz within a 10 – 30ft range. This unit currently available on the market for $50. The last item is the Griffin SmartShare, which may sound like a pointless product, but can be very useful. The SmartShare is a splitter with individual volume controls so two persons can listen to music with standard headsets at once. This is an ideal product for people who are often in noisy areas and are trying to let others listen to their music. This item is a much cheaper than the other two products, costing only $15. The iFM is not an FM transmitter. It is an FM radio and remote. The iTrip is a transmitter. Thank you for catching our mistake, I can not believe that we did that. We have fixed up the article now, we’ll be more careful in the future. The iFm is valid for listen radio?